The kick of fajitas with the crunch of a taco combine in these tostadas. At $1.50 per serving, they're also a tasty bargain. 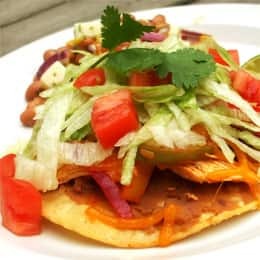 Use pre-made tostada shells and pre-cooked chicken to make prep and clean-up easy. Combine taco seasoning, water and lime juice and stir well. Pour half of the taco seasoning mixture over the shredded chicken and the other half over the pepper and onion. Cook chicken in a large skillet over medium-high heat until the sauce starts to thicken slightly -- 2-3 minutes. Remove chicken and keep warm. Add peppers and onions and cook until the sauce starts to thicken and veggies start to wilt -- about 3-4 minutes. Remove and keep warm. Lay tostada shells on an ungreased baking sheet. Top each shell with 2 tablespoons refried beans, 1/4 cup shredded chicken, peppers and onions and cheddar cheese to taste. Bake until the cheese just starts to melt -- about 5 minutes. Remove from oven and serve with optional garnishes.